The Nevada eviction forms are given to a tenant in accordance with NRS 40.280 whether they have broken a condition of their lease agreement due to not paying rent, lease violation, or being it the end of a month to month tenancy. Also known as a “Summary Eviction”, the landlord must give a Notice to Quit to the tenant either by personal service (face-to-face) with a witness, certificate of mailing (return receipt), or the service from a Sheriff or constable. Afterwards, if the tenant does not comply with the terms and either rejects the request to cure or fails to vacate, the landlord may follow through with an eviction action (See Process Handbook) in the Local Justice Court. Flowcharts – Use to view a simplistic guide whether the eviction is for the Non-Payment of Rent or for Any Other Lease Violation. 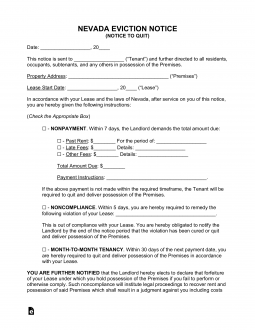 5-Day Notice to Quit (Non-Payment of Rent) – This form is for use when a tenant owes past due rent. Landlord must allow the tenant five days to respond before beginning the eviction process. 5-Day Notice to Quit (Non-Compliance) – This form is for use when a tenant has failed to abide by the terms of the lease other than non-payment of rent. 30-Day Notice to Quit (Month to Month) – This form is for the parties to use when one or the other wants to end a month-to-month tenancy. Rent is due on the date specified in the lease agreement between the tenant and landlord. If tenant fails to pay rent, landlord must provide five days notice to tenant before beginning the eviction proceedings in court. Step 2 – After being served with the Notice to Quit the tenant will have five (5) days to file with the Court an Answer Form (for Non-Payment of Rent or other Lease Violation). Subsidized Housing – If the tenant is receiving government assisted rent then this form should be used. Step 3 – After the five (5) day period the landlord can file a Complaint (for Non-Payment of Rent or other Lease Violation) in the Local Justice Court with a Coversheet. You will also need to provide a copy of the lease (if there is one) , a copy of the notice delivered to tenant and evidence that the notice was delivered. A hearing will be set and both parties should attend. Step 3 – If at the hearing the Judge rules in the favor of the landlord an Order will be granted and the tenant will be required to move-out or be forced out by a Constable who will have the legal right to “lock-out” the tenant from the premises. The Nevada Property Lease containing both Lessor and Lessee Signatures should be made available for quick reference while filling out some of the information on the intended notice. The Nevada Notice To Quit may be retrieved using the PDF, ODT, and Word buttons on this page. Record the Legal Name of the person this document must be addressed to. If this Name appears on the Lease then, make sure to transcribe it properly. The Lease will need cite two facts in the first part of this notice. The first fact will be the location of the Rented Property. Report this by presenting the City, County, Zip Code, Building/Street, and Apartment this Notice is focused on. The second fact to be reported will be the Signature Date. This must be presented in the second statement of this document. The next two statements provide a choice for Landlords or Landlord Agents to provide an appropriate warning to the Recipient of this Notice. Select the one that applies. If neither apply, then proceed to Step 4 without checking either of these boxes. Select the “Nonpayment” check box to give the Tenant(s) or Subtenant(s) who will be given Five Days to correct a Lease Violation or yield the Property to the Landlord. Fill in a description of the violation on the blank space in this paragraph. If the subject of this Notice is simply a Month to Month Lease Agreement, then select one of the following statements by marking the appropriate statement. The first “Month To Month Tenancy” check box will give the Tenant at least Thirty Days’ Notice until the last active Calendar Day of the Month to Month Agreement. This Date must be reported here. The second “Month to Month Tenancy” check box will give the Landlord at least Thirty Days’ Notice until the last active Calendar Day of the Month to Month Agreement. The last Calendar Date this Lease will be active must be at least Thirty Days after the Landlord receives this document and must be reported in this statement. The “Certificate of Service” statement requires the Calendar Day, Month, and Year this Notice is delivered to be entered on the first, second, and third spaces. The fourth space must have the Full Name of the person who this paperwork was delivered to. The three check box statements in the “Certificate of Service” section should be marked according to the method of delivery. The options will define a direct delivery to the intended recipient, a delivery to a second party such as a co-worker of the recipient who is extremely reliable and has agreed to continue the delivery to the intended recipient, or mailed First Class Mail using the U.S. Postal Service.